My interest in narrow gauge and industrial railways goes back to my childhood, and my modelling ranges from 009, 0ng, 16mm, a spell in 2′ and finally 7 1/4”. My foray into laser cut steel fabrications all started when we needed some point levers for the 7 1/4” High Legh Railway near Knutsford, which I helped to build. The early points there had sprung blades and needed a heavy lever, and there was nothing commercially available. As my background is in mechanical design, I drew some up in Autocad and got the steel cut out by laser. At the railway opening Frank Sidebottom, a committee member of the 7 1/4” Society, spotted them and gave them a write up in the 7 1/4” NEWS. There was a fair bit of interest in them so I made a few more and soon added different sizes of couplings to the ‘range’. All my assemblies are designed to have tabs which drop into slots on the next bit, so that as far as possible only a bit of weld and a quick clean up with the grinder is needed to turn the laser cut steel into a finished item. If jigs are needed I get them laser cut as well, to make the assembly process as painless as possible. We had a series of baffling derailments on the railway involving brand new bogies. After a lot of investigation it turned out that the wheels and axles all had different back to back settings, some so far apart that they would not actually fit between the rails, a fault not easy to spot without a gauge. To allow us to easily check these in the future I produced a batch of laser cut gauges, and advertised them on the Society website. They have proved so useful that I have now made a second batch of them. Every railway should have at least one of these! As well as checking that home and visiting locos meet the society standards, the gauge is equally useful for checking tread and flange wear. If there are published standards for 10 1/4” and sufficient interest amongst members I could get a small batch made for this gauge as well. 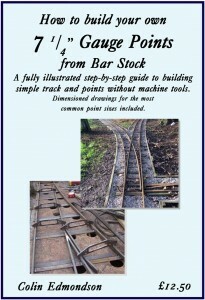 Having engineered a quarter mile extension to the railway and built some 13 points to date, I thought that there might be some interest in a booklet explaining how to build simple points from bar stock without the need for any machine tools, just an angle grinder and welder. As I had so many points to make I also designed a selection of laser cut track gauges to hold the bar stock in place as I built the points. They worked well, so now I sell both booklet and gauges as well. The methods would lend themselves equally well to building in 10 ¼, although I don’t think that the use of bar stock for rails is quite so common in this scale. They come in 3 different gauges, 184mm for straight track, marked with ‘S’; 185mm for generous radius curves, marked ‘C’; and 186mm for tighter curves, marked ‘C+’. The ‘two peg’ gauge is designed to check the gauge, whatever type of rail is being used. The ‘four peg’ gauge is designed to accurately hold 10mm thick bar stock rails whilst welding is taking place. The ‘six peg’ is designed for the same use as the ‘4 peg’, but in addition will locate check and wing rails to the correct back to back measurement as well. 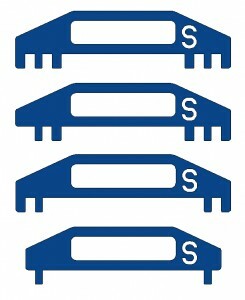 The odd one out, the ‘5 peg’, is used in point building when working around the frog, where a standard 6 peg gauge will not fit. 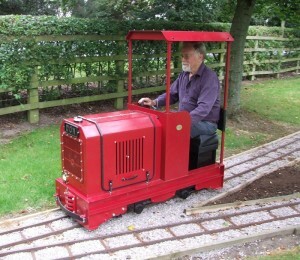 I followed this slot and tab idea to a successful conclusion with my loco DON, a half scale Ransomes & Rapier (ish), which is running on 7 ¼” at the moment, but is equally suited to 10 ¼”. All the steelwork can be assembled without any measuring or jigging, and every other part is a bolt on fit, so assembly is very quick, almost like an Airfix kit with electric arc glue. The loco chassis has 2 horizontal 6mm plates about 4″ apart, the upper carries the engine and transmission, the lower forms the foot well and carries the spring upper mounts. The spacers between form the uprights of the side channel frames. The buffer beams tuck under at the bottom for strength and carry the battery and air compressor. The running gear is mounted on a totally separate frame, along with the brake gear, the rest of the loco being mounted above it via rubber springs, thus allowing sideways flexibility as well as up and down movement, which means that a heavy short wheelbase loco will not hammer the track with a horizontal pendulum effect. There is no sliding metal to metal contact anywhere in the running gear. Driving and braking loads are transferred between upper and lower frame by a rubber mounted radius rod. The design is therefore complicated, but all the bits are laser cut and ready to weld. The body is all 3mm steel, for adhesive weight, and there is a sandbox fitted as well, the filler is disguised as the radiator cap. The prototype has a 5hp petrol engine with mechanical drive, but there is sufficient space to fit a hydrostat or petrol electric drive instead. At the moment it is running as a petrol mechanical, but conversion to a petrol electric is to start as soon as my land based workshop is up and running, as living on a narrow boat does limit what can be achieved to a certain extent! My good friend John Tackley tries out DON for the first time. Believe it or not, five hard days work saw all the steelwork finished. The lower chassis is flexible in twist, and carries wheels and axles and brake gear. The upper chassis sits on the four rubber bushes. It would be easy to substitute a 10 1/4” chassis in its place. Here the air brakes are under test. Since then I have produced quite a few batches of point levers and couplings for other railways and I generally order a few spare sets for general sale to other enthusiasts. Speed, whistle and slow signs have been added, and a proportional air brake valve. All these signs have 130mm high letters, are laser cut from 3mm steel, have two fixing holes to suit M6 bolts, and are supplied unpainted. The ‘SLOW’ sign has an overall width of 340mm. Add that little bit of atmosphere to your railway. You could also mount one on a spike as a reminder of a temporary speed restriction, perhaps after track maintenance. 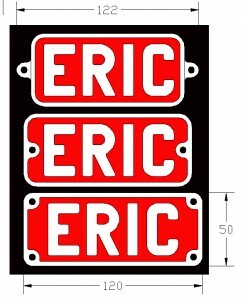 I have also made quite a few nameplates from 3mm steel plate. They may not be brass but they are certainly chunky, and once polished and lacquered seem to last well. The backing plate has slots in it, allowing the letters to be welded on from the back. The WREN plate is about 6” long. 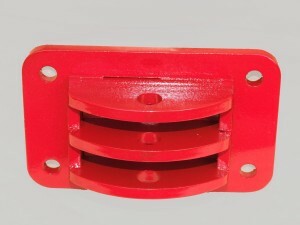 The coupling have holes to take your choice of 10mm diameter coupling pin, which is not supplied, as every railway has its own preferred method. Three slot coupling suitable for larger narrow gauge outline locos. Made from 6mm laser cut steel, the backing plate is approximately 7” x 4” with four fixing holes to take M8 bolts. Approx 3kg a pair. I will soon have chopper couplings and centre buffer couplings to add to the range, each with a hidden pocket to take 25mm x 10mm coupling bar and a 10mm pin. 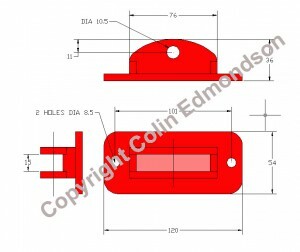 They are designed to swivel, and have provision for a spring or rubber buffer to be included behind the buffer beam. The point lever is made from 6mm laser cut steel, with carefully profiled contact faces to ensure efficient operation with a minimum of wear. The baseplate measures 7” x 4” and the lever stands 13” high. The maximum stroke is 1”, 25mm, and with all the weights fitted the maximum pull is 10lb, 5kg. 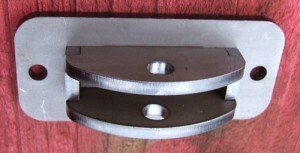 A bolt can be inserted through the top hole to prevent the lever being thrown over, as shown in the main photo. The lever can be built in three different modes, parts to make all 3 versions are included in each point lever kit. The upper detail photo shows the most common mounting position, when the lever is parallel to the track and the operating rod is attached to a bellcrank which moves at 90 degrees to the lever. The bellcrank can be turned over to reverse the operation. In the middle detail the lever is parallel to the track and the operating rod also runs parallel to the track to a remote point, handy if you want to stop and change a point before you get to it. 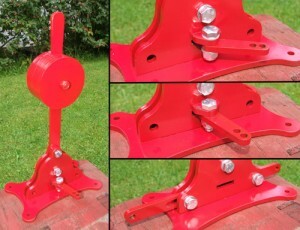 I can also supply a separate bellcrank to use with this type to turn the operating rod through 90 degrees at the point. In the lower detail the lever is fitted with a slider between the side plates, to which is attached the operating rod. This means that the point lever sits at 90 degrees to the track centreline and the lever ‘points’ to the direction that the train will go. A lever in this position needs to be set back further from the track if it is not to become an obstruction. 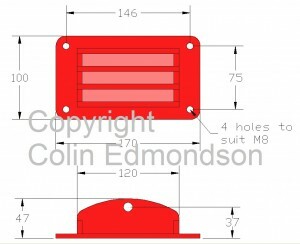 There is no reason, given a sensible sized order, why the design could not be scaled up to 10mm plate instead of 6mm. In praise of laser cutting. Some folk may frown on my production methods, as they stray away from what is considered acceptable to the model engineer. That is fine by me, as I don’t pretend to be a model engineer, I simply don’t have the skill or the patience. What I can do is produce multiple parts both cheaply and quickly, with a good standard of finish, allowing more time for playing! All my parts are drawn up in Autocad, as that is the software that I am used to. There are many cheaper drawing packages available on line, and some free ones as well! It takes a while to learn the software enough to be able to use it for design purposes, but if you have an existing drawing of a part it is fairly easy to copy it on the screen. Once this is done, one item at a time, the drawing file is exported as a ‘dxf’ file, a universal drawing interchange format, which is accepted by most profile cutters. The firm that I use allows me to upload these files on their web site, adding the thickness of the part and the number needed. I can then get a quote on line, modify the quote to see what difference it makes if I order more sets of parts, turn this into a firm order and pay for it by Paypal. The steel is delivered fairly quickly, they guarantee within twelve days. All this without leaving the the crammed little cubbyhole full of ‘stuff’ on the boat that serves me as both a design and publishing house and an office. Using a laser is not the only way to cut steel accurately in batches, plasma also has its uses, but does not give quite as good a finish in my experience. Plasma cutters are suitable for the home workshop, and can be bought on line. Some models even incorporate their own built in air compressor, and home made templates can allow pretty accurate cutting. If you want to go one stage further, computer driven X-Y tables can be bought as well, I don’t know enough to connect the two together! Water jet cutting tends to be more expensive but gives a beautiful finish, and with a side benefit that it does not produce any surface hardening. This allows holes for bearings in side rods, for instance, to be cut almost to finished size and simply reamed to finish. Laser cutting can harden the cut surface slightly, but in my experience I have had no problems filing edges or opening out holes with a larger drill. I have not tried it with an expensive reamer, though. Expanding the idea to produce a complete loco makes for expensive material costs, but a very quick build. I could produce the same thing for a fraction of the cost, but it would probably not be as neat, it would take ten times as long, and even if time is not money to you there are lots of other things that also compete for our limited leisure time. As I said earlier, I live on a narrow boat, and my workshop, only 10′ x 6′, also floats. Any project requiring time needs a home, and I simply don’t have the space. Projects that arrive as pre-cut steel and leave very quickly are far easier to find a home for, the loco was built from arrival of steel to a fully painted and assembled steelwork stage in a gazebo on my mooring in under a fortnight! If you see anything that interests you please don’t send a cheque, just get in touch and I will let you know what I have in the workshop or I will add your parts to the next steel order. I am not a trader and do not hold stock, just a fellow enthusiast who is happy to make a few extra parts for others. Once there is enough interest to fill a minimum order I will order some more steel, and the larger the number of identical parts the cheaper the steel pieces become. All items are supplied unpainted, but with the gaps between the slots and tabs sealed with a magic mixture ready for painting. I would recommend painting by brush to get a decent load of paint onto what will probably be a well used and abused fitting. If you want to order more than one item I will sort out a price including combined postage. The p+p may seem steep, but it generally includes tracking, signed delivery, and my having to walk half a mile to the Post Office. I prefer payment by paypal or BACS, if you wish to pay by cheque I would prefer to wait until the cheque has cleared. If you wish you can pick up items either from myself or from High Legh Railway, near Knutsford, Cheshire. Prices are given below are for guidance only, as they vary according to the price of the laser cut steel. Please contact me for an up to date list. 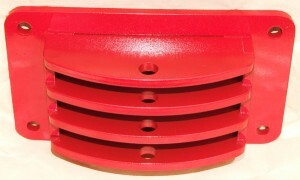 All items are supplied unpainted, but with the gaps between the plates sealed with a magic mixture ready for painting. I recommend painting by brush to get a decent layer of paint onto what will be a well used and abused fitting. Prices for post and packing includes my half mile walk to the Post Office, as none of these will fit in the letter box. I am happy to combine postage on multiple purchases. If you wish you can pick up items either from myself or from High Legh Railway, near Knutsford, Cheshire. 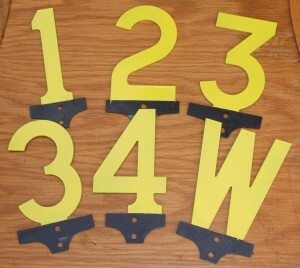 A pair of simple nameplates, such as WREN above, are about £50 a pair polished but unpainted. This included the time I spend preparing the drawings.